Haute Whimsy: I'm a Pepper! I'm just thinking here ... Dr. Pepper should have its own national holiday! Everyone seems to love the stuff, and I think it's absolutely magical! 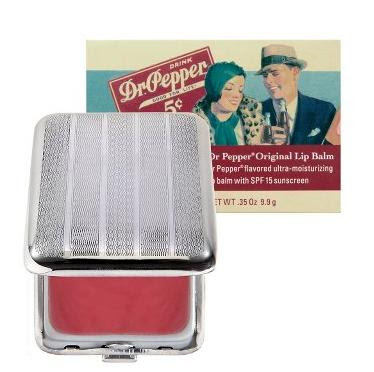 I remember as a kid, we weren't allowed to have soda in school, so I would "sneak" Dr. Pepper lip gloss from Bonne Belle and pull it out at recess. I thought I was such a rebel! UPDATE: Look at what I just found at Sephora! Haha how cute! I love Dr Pepper too. Even the Diet Dr Pepper taste good. Have you had the new cheery one? I love diet dr pepper too! I'm quite a fan of dr. pepper, as well. especially when mixed with stoli vanilla. I am D. E. F. a Pepper! I have kinda fallen head over heels for the NEW cherry flavor... it's the bomb dot com! Dr. Pepper is pretty much my soda of choice. And the best part about it is you place that have coke & pepsi will both have it!